In the first quarter, the pressure was hot early with both teams bringing the heat. Neither team were able to score due to the pressure, composure and execution associated with kicking goals in finals. The Blues led by Tayla Harris dominated the early parts of the quarter but were unable to capitalize on their opportunities in their forward 50. Gabby O’Sullivan scored the Dockers first goal and the opening goal of the match after the Dockers moved the ball quickly forward and the Blues became panicky in defense resulting in the goal. It was scored after the Dockers took the advantage after a Nicola Stevens hold. Late in the first quarter, the Blues finally were able to get reward for their effort with a goal from Harris who converted truly from the set shot. Harris’ goal was the perfect answer to a hard controversial week for the Blues forward star. The Blues led by four points at quarter time. It was an amazing second term from the Blues with four huge goals. The Blues dominated the Dockers with their immense pressure in and around the contest. Harris took a massive chest and she set up Bree Moody who opened the scoring, as she slotted through the Blues goal with the their seventh inside 50 in the second term. Harris showed her strength and took a crunching mark but could not convert the set shot. Georgia Gee had a clean pick up and clean handball to Chloe Dalton who kicked the goal accurately. Soon after, Maddie Prespakis put through the goal straight through the middle. Just before the siren sounded for half time, Harris kicked nicely to Darcy Vescio who took the mark. Vescio booted through the major. The Blues had an advantage of 29 points at the main break. The Dockers locked up the Blues scoring for in the third term. It was one stoppage after another until late in the quarter when the Blues piled on two goals. It was the Dockers that notched up the first major of the term and it was an impressive surge forward where Ashley Sharp handballed beautifully to O’Sullivan who stormed in and booted through her second goal of the match. There was some nice handballing from the Blues that resulted in them freeing up a couple of players in Vescio who kicked to Tilly Lucas-Rodd who nailed through the goal. There were clean hands from Brianna Davey to Dalton who kicked a superb long goal from the centre with a nice bounce. The Blues were up by 36 points at three quarter time. The Blues maintained their dominance well into the final term and held off the Dockers who lifted their intensity and tried to get back into the match. There was a good kick inside forward 50 from Dockers to Gemma Houghton who converted the set shot truly from just inside 50 for a much needed goal. Sabreena Duffy took full advantage and nailed through the Dockers second consecutive goal. 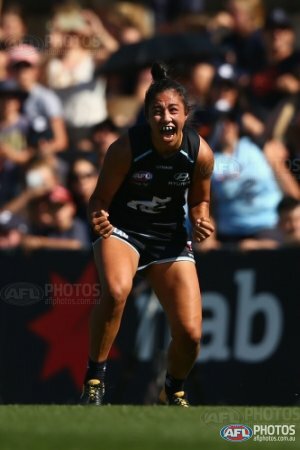 There was loads of desperation shown from both defenders and forwards inside the Blues forward 50 and Stephanie Cain was involved in a heavy knock that she came off the ground. Brooke Walker booted through the Blues first goal of the last term. Sarah Hosking slotted through another beauty for the Blues and it topped of an incredible day for the Blues. The Blues thrashed the Dockers by 36 points in an incredible four-quarter performance from the Navy Blues who outplayed them with their first class pressure. Blue Baggers are off to their first ever AFLW Grand Final, get excited Blue fans!! !